A public inquiry into Irish mother and baby homes has said there "must be" people in County Galway who "know more" about residents' burial arrangements. Nearly 800 children died at a mother and baby home in Tuam in the county between 1925 and 1961. Significant quantities of human remains were subsequently found at the site, some in a septic tank. In its latest report the inquiry has encouraged people in the surrounding area to come forward. The Irish government set up the Mother and Baby Homes Commission of Investigation in 2015 to investigate the Tuam burials and to conduct a wider examination of how mother and baby homes were run. The Tuam home was run by the Bon Secours order of nuns. The remains found at Tuam in 2017 are believed to have been those of stillborn babies and babies and infants up to the age of three who had died as far back as the 1950s. The commission is excavating the site for a detailed forensic investigation. Its fifth interim report, published on Wednesday, is highly critical of the Sisters of Bon Secours and former members and officials of Galway County Council, which owned the home. The report states that council members and staff must have known something about the manner of burial as the authority's sub-committees sometimes met on the site. It said employees would have been in the grounds "quite frequently" to carry out repairs to the building and "possibly" also maintained the grounds. 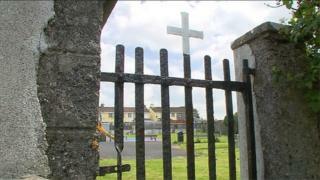 It highlights concern over burial practices at a number of former maternity institutions. Referring to the grounds of the Bessborough home and maternity hospital in County Cork, the commission said it was "likely" that some of the children were buried in the grounds but it could not find any "physical or documentary evidence" of that. It said it was "highly likely" that burials did take place in the grounds of Bessborough. However, as no physical evidence of possible locations was found, the commission did not consider it feasible to excavate 60 acres "not to mention the rest of the former 200-acre estate". Representatives of the institution's owners - the Sisters of the Sacred Hearts of Jesus and Mary - told the commission they had little information on burials as Bessborough's records were held by Tusla, the Child and Family Agency, and it had no access to them. The report states that a number of the congregation's nuns provided evidence to the commission but "were able to provide remarkably little evidence about burial arrangements". Excavations are also taking place at another former home at Sean Ross Abbey in County Tipperary. The report was published by Irish Children and Youth Affairs Minister Katherine Zappone, who said it was "significant". A spokesperson for the Tuam Babies Family Group told Irish national broadcaster RTÉ that there were serious issues around the interim report. Anna Corrigan said the issues around Tuam were criminal and were a matter for the coroner and the Garda Síochána (Irish police force), which she said "need to step up and do their job". The commission's fifth interim report states that there are still many of unanswered questions. The full report is not expected to be released until next year.